With the start of the year I started the new project of teaching my 4 1/2 year old son to quilt. This week we had a chance to get started with the piecing. At this point I'm still working the pedal for him (very slowly) while he guides the fabric. (Yay for the 1/4" foot!) He's learned all about the parts of the machine (presser foot, feed dogs, etc.) and the basics for how to sew (putting up/down the pressure foot, changing the foot on the machine, how to put the bobbin in). He's especially focused on using a light touch to hold onto the fabric while he guides it. Now he says, "check how easy it is to pick up my hand, mom." And when he gets too firm of a grip then I shake his hand and remind him to have spaghetti fingers. ;-) He's become a chain piecing machine and likes the "mountains of fabric" it makes behind the machine. We're working toward piecing each row. So far he's pieced the 3rd to 4th and 5th to 6th piece in each row. 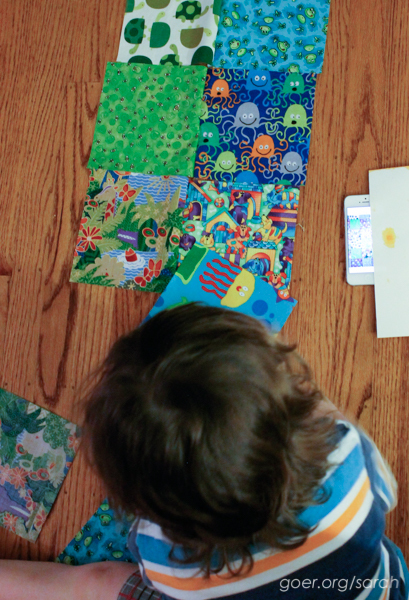 To stay organized, as he's pieced each batch he's laid them out on the floor to compare to his planned pattern. He likes all the tools, so he's been excited to use the wonder clips and pinmoors to keep his fabric organized and labeled. This week I hope we get to finish piecing the rows together and I can teach him to press the seams. I'll show you my progress on the other one-block quilt from my part 1 post next week. Continue following how we're doing in Part 3. 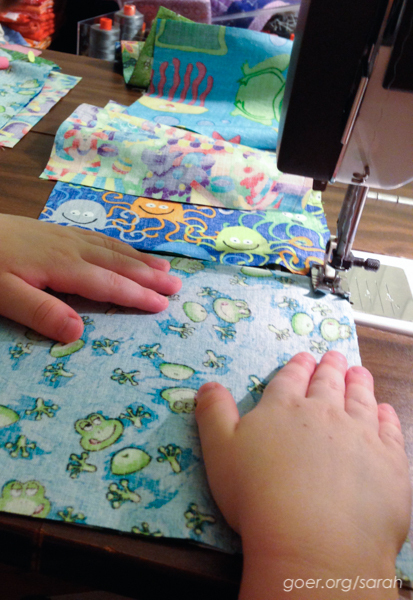 Linking up to Sew Cute Tuesday, Fabric Tuesday, Show & Tell Tuesday and WIP Wednesday. Posted in Quilting. 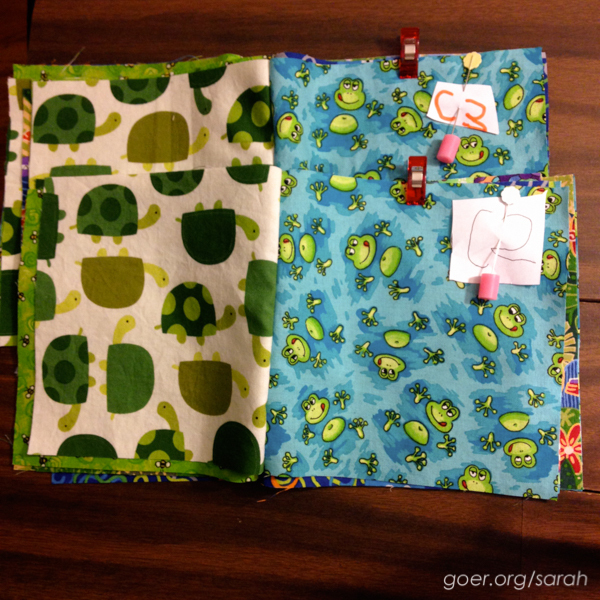 Tags: quilting with kids on January 12, 2015 by sarah. I am looking forward to seeing the finished product. Thank you, Kristen. I think the secret for me is to working with him a little bit at a time. He's always really excited when I ask him if he'd like to work on his quilt. And that you are teaching him to press next week. One of my favorite things is to teach sewing. It has so many inherent 'life skills'. Using an iron being just one! Oh! I could quilt an outline of his hand onto the quilt (and maybe again onto a mini quilt for myself since he plans to give away the one he's making). That would be fun. Thanks for the idea! Looking really good! My two-year-old is totally fascinated by the sewing machine and will grab my scraps and climb up and pretend he is sewing; I can't wait until he's old enough to actually teach him. 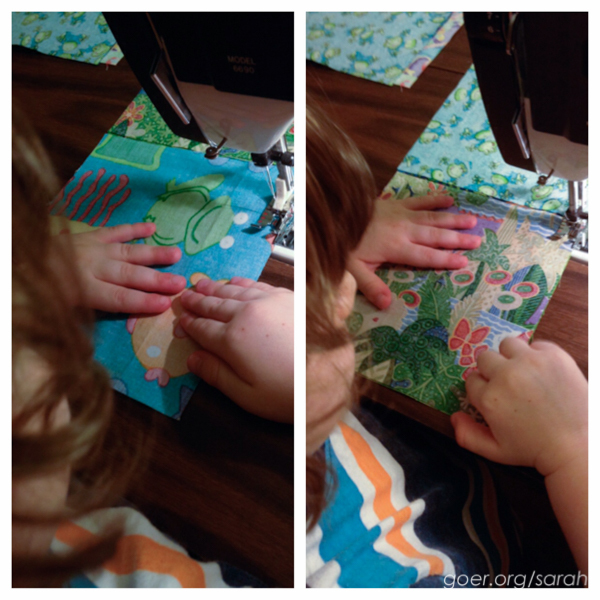 I think my little nephew would like to sew too! You have inspired me, thank you! This sort of choked me up. He is really into it, isn't he. I love the pudginess of his hands guiding the fabric as well as the labels he made for the rows. Really sweet! He's got a good mama, for sure. You're so sweet, Bernie. Yes, he's very excited about sewing. We should probably try to squeeze in a few minutes before dinner. So sweet. The fabrics are cute. Did he pick them out himself? He picked them out from my stash. He was interested in anything with animals. I didn't let him use a couple I have earmarked for a baby quilt, but I think he may have chosen some of everything else. ;-) Part 1 of the series shows the pattern he chose for the layout of the blocks. Thanks for visiting! I am amazed! My son made his first quilt when he was ten. We stuck to paper crafts before that. So far so good. :-) He's been hand sewing at school, so I offered to help him make a quilt on the machine and he jumped at the chance. Looks like he is doing really well, I've tried in the past to get my eldest daughter (4 and a half) to sew but I think I scared her when I explained why she needed to keep her fingers away from the needle when the machine is going. I might have to try again, she'd be very interested in learning about the different parts of the machine. What fun! 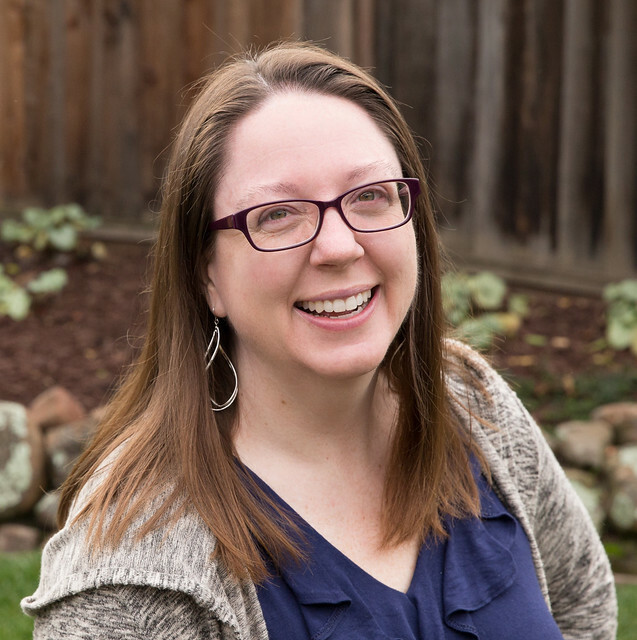 Welcome, new quilter. You're doing great. Thanks, Megan. I'll pass along the message. He loves talking about it at school, and uses all the correct terms of course. Aww... that's so fun! Thanks for sharing. This is so precious - you will always treasure these memories Sarah! Your son is very bright and creative! I think reading these two posts has made my whole day. Our "baby" is 21 and leaving tomorrow for his first after college job. I never could get him to sew, LOL, but my girls both do. You are so sweet. Congratulations to your son. I know the time will come for college and the real world for my kids before I know it! Time sure flies! !